By thy God-inspired life/ thou didst embody both the mission and the dispersion of the Church,/ most glorious Father Columcille./ Using thy repentance and voluntary exile,/ Christ our God raised thee up as a beacon of the True Faith,/ an Apostle to the heathen and an indicator of the Way of salvation./ Wherefore O holy one, cease not to intercede for us/ that our souls may be saved. "Iona: The Earliest Poetry of a Celtic Monastery" (Edinburgh, 1995). Scion of the most powerful family in the north of Ireland, founder of monasteries, and instigator of missions to the Picts and the English, Columba is undoubtedly the most important saint associated with Celtic churches. Legends about him grew over the centuries, and many of the stories must be treated with caution. One of the more famous paints him as a sort of Christian sorcerer's apprentice, naughtily copying his master's precious psalter by the light of his own hand, and thereby sparking a major battle! So too, hundreds of poems, some quite romantic in their descriptions of nature, others simple devotional verses, were attributed to the saint long after his death. Nevertheless, through the obscuring mists of his legends, it is possible to make out an outline of this key figure in the early Gaelic church. In fact, of all the Celtic saints, he is also the one about whom we know the most historically. Columba was born of royal stock around 521, in northwestern Ireland's Donegal. Although destined for the church by an early age, his noble birth gave him insight and influence in the political world. Legend tells us that his original name was Crimthann ("fox") and that when he was trained as a priest he changed it to Columb, ("dove"), later known to all as Colum Cille: "dove of the church." It has become something of a tradition in modern times to view the saint through the twin lenses of these names: the astute fox on the make, and the peacemaking and peaceable dove. He apparently took part in a battle in 561 between his near and more distant cousins; this led to his exile and even excommunication for a time. Yet his biographer and successor, Adomnán, saw it differently, glossing over his excommunication, and telling us only that: "In the second year following the battle of Cúl Drebene, when he was 41, Columba sailed away from Ireland to Britain, choosing to be a pilgrim for Christ." Despite the skeletons in Columba's closet, his efforts in Scotland reveal a man who had learned much in his 41 years, enough to establish a string of monasteries in the Inner Hebridean islands off the west coast of Scotland. This monastic system anticipated later orders such as the Cistercians and Carthusians. Iona, a small island off the larger Hebridean island of Mull, was the fertile centre of this system. Remote to modern eyes, Iona was at the hub of early medieval sea lanes that brought pottery and perishable goods north from France and the Mediterranean. Still, Iona was intended as a true monastery, a place set apart for Columba and his brethren. Other island monasteries, such as one on Tiree, housed lay-folk serving out penances for their sins. Another island housed older, more experienced monks living as holy anchorites. Iona, however, trained priests and bishops, and Columba's reputation for scholarship was great when he died (though we have little of his own work). From Iona, priests and monks ranged far and wide, founding churches in Scotland and seeking "deserts in the ocean" (lonely, distant islands). Monk Columba's legends give us a flavour of both the fox and the dove. The Life of Columba, by Adomnán, is packed with stories about Columba conversing with angels, sending an angel to rescue a monk falling from a roof, and being whipped by an angel to convince him to ordain God's (rather than his own) choice for king of the Gaelic colony in Scotland. He is seen rapt in contemplation, seeing "with a mind miraculously enlarged . . . the entire orbit of the whole earth and the sea and the sky around it." From these visions, he proclaims prophecies, sends monks to help distressed people, or prays to refresh his tired monks labouring in the fields. Columba holds his own with kings. Though he prays for the military success of kings whom God has chosen, he argues with angels over their appointment. He faces down the king of Picts through his power, blasting him with loud psalms, throwing wide his strong oak doors, and besting the magic of the king's druids. He even defeats wild animals: a fierce boar drops dead on the spot, and a strange monster on Loch Ness runs from his power. Though Columba's power is often depicted in entertaining form, his influence was in fact the key to winning over the kings of Gaelic Scotland, and his legendary powers were famous enough for his monks later to convince the Picts to convert. Scottish army at Bannockburn in 1314. One particular appearance, decades after his death, to the English king of Northumbria was pivotal in the history of Christianity in Britain. That king was Oswald, who had been raised in exile in Iona. As Oswald fought the battle in which he secured his kingship, Columba towered above the field promising victory, as one modern scholar puts it, like Batman over Gotham. In 635, Oswald sent for missionaries from Iona to renew the flagging Christianity of Northumbria with their monastic sobriety and good works. Columba was a poet, scholar of wide-learning, monastic founder and leader, a visionary churchman. At the time of his death on June 9, 597, he was already celebrated. 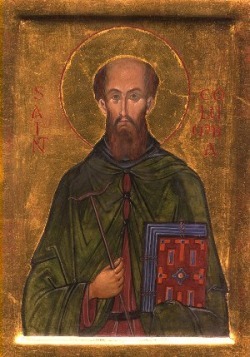 Though more monk than missionary, Columba established churches in Scotland that went on, in time, to evangelize the Picts and the English. The legacy of the monasteries he founded, which drew constantly on the inspiration of their patron saint, multiplies many times the influence of the man himself. Fittingly, at the end of the Life, Adomnán has his hero ascend the little hill near the monastery on Iona, and declare: "This place, however small and mean, will have bestowed on it no small but great honour by the kings and peoples of Ireland, and also by the rulers of even barbarous and foreign nations with their subject tribes. And the saints of other churches too will give it great reverence." danger from domestic violence, common abuse, and appalling labour conditions). Adomnán's Law imposed strong punishments against offenders. It is a remarkable landmark in the history of law. these tales reinforce the stern message of the Law. In the most famous, Columba is a young boy, studying in a meadow with his tutor. A young girl appears, pursued across the plain by a vicious thug, who spears her at the very feet of the clerics. Appalled, the tutor cries, "How long, Columba, my holy son, will God the true judge let this crime and our dishonour go unpunished?" Columba calls down God's wrath on the killer, who falls dead on the spot. he was foremost at the book of complex Law.